NES Castelian (USA) in 14:51.63 by DrD2k9. Castelian is a puzzle platformer in which the basic goal is to ascend towers from the base to the apex. 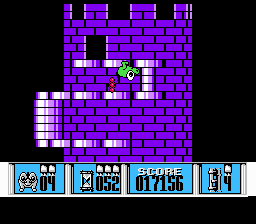 Your frog-like character is tasked with demolishing these towers by planting a bomb at each tower's top (wouldn't bombs around the bottom be easier?) after finding the right route up the tower. The game was also released on other systems as Nebulus, Kyorochan Land, Subline, and Tower Toppler. Powerhouse NES runner DrD2k9 runs, jumps, and shoots his way up all the towers in under 15 minutes.